Available in: 11.8kg & 2kg bags. Do you need a Simple Solution? At Wellness, every ingredient we choose has a purpose, especially when it comes to dogs with food sensitivities. Our natural, limited-ingredient diet dog food recipes keep it simple with a single source of protein and easily digestible carbohydrates, without extra fillers or additives. This short, yet complete, list of key ingredients nourishes simply and completely from the inside out with results you can see. 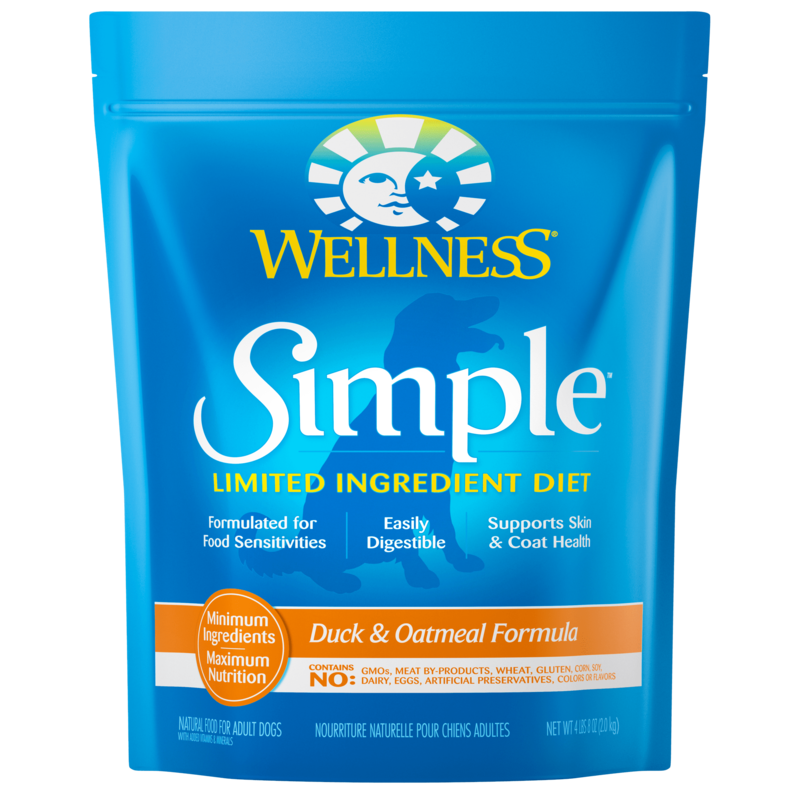 Just like all Wellness dog food recipes, what stays out is as important as what goes in, so we don’t use wheat, corn, soy, gluten or artificial preservatives, colors or flavors in this simple formula. As animal lovers, nutritionists and vets, our mission is to provide your pet a healthy, happy, long life through the power of natural nutrition. Talk to your vet about this natural alternative to therapeutic prescription diets. The choice for natural relief is simple. 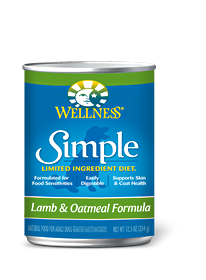 Lamb, Lamb Meal, Oatmeal, Peas, Ground Rice, Millet, Ground Flaxseed, Canola Oil (preserved with Mixed Tocopherols), Tomato Pomace, Natural Lamb Flavor, Chicory Root Extract, Vitamins [Vitamin E Supplement, Beta-Carotene, Niacin, d-Calcium Pantothenate, Vitamin A Supplement, Riboflavin, Vitamin D-3 Supplement, Vitamin B-12 Supplement, Pyridoxine Hydrochloride, Thiamine Mononitrate, Ascorbic Acid (Vitamin C), Biotin, Folic Acid], Minerals [Zinc Proteinate, Zinc Sulfate, Iron Proteinate, Ferrous Sulfate, Copper Sulfate, Copper Proteinate, Manganese Proteinate, Manganese Sulfate, Sodium Selenite, Calcium Iodate], Choline Chloride, Mixed Tocopherols added to preserve freshness, Taurine, Dried Lactobacillus plantarum Fermentation Product, Dried Enterococcus faecium Fermentation Product, Dried Lactobacillus casei Fermentation Product, Dried Lactobacillus acidophilus Fermentation Product, Rosemary Extract, Green Tea Extract. It is important to slowly transition your dog from his/her current diet as it takes a few days for the body to adapt to new nutrient levels. To transition, gradually mix in the new food over a 5-7 day period, increasing the amount of Wellness Simple each day, so that you are feeding 100% Wellness Simple by day 7. This food is formulated for adult, non-reproducing dogs over one year old as puppies and pregnant or nursing mothers have special nutritional requirements. Divide the total grams per day by the total number of times you feed your dog per day. Please use the information below as an initial recommendation only and adjust as needed. Every dog is a little different, so optimal feeding amounts may vary with age, size, activity level, breed and environment. Give your dog access to clean, cool fresh water at all times and feed Wellness Simple wet food in combination, whenever possible, to increase the level of water in your dog’s diet. Nutrition is the foundation of wellbeing, but be sure to give your dog plenty of love, exercise and see your veterinarian regularly! For dogs over 56.8kg: Add 30 grams per additional 4.5 kg. Combination Feeding: If feeding with wet food, reduce dry amount fed by 39 grams for every 170 grams of wet food. Calorie Content: This food contains 3,443 kcal per kilogram or 406 kcal per cup ME (metabolizable energy) on an as fed basis (calculated).